alaTest har samlet og analyseret 126 anmeldelser fra magasiner og hjemmesider. Anmeldere kan virkelig godt lide lyden. Også pålideligheden imponerer, men batteriet værdsættes ikke af folk. Vi analyserede bruger- og ekspertratings, produktalder og andre faktorer. Sammenlignet med andre Trådløse Telefoner får Panasonic KX-TGEA20 en samlet alaScore™ på 89/100 = Meget God kvalitet.
" everything went as expected......................... "
" Based on the features of this phone system I decided to eliminate the land line and rely on cell phones only. Having a larger house, the ability to answer the cell phones from any handset is great. " 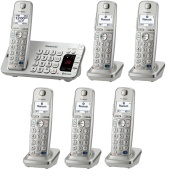 Inexpensive , Durable , Exceeded expectations , Convenient , Easy to use , announces calls. , has an easy answering machine. , each handset has a blinking call light. , great for the hearing impaired. , range extender works wonders. isn't the most stylish phone. Convenient , Easy to use , great new features! Poor quality , the phone itself is very light weight & flimsy.
" System does not have visible indicator showing telephone VM has been received. Otherwise, I am pleased with product. " Inexpensive , Durable , Exceeded expectations , Convenient , Easy to use , i've drop it a few times works great!
" I HAD THREE PHONES AND I AM ADDING A FORTH. IT IS SO EASY TO MONITOR INCOMING CALLS. EASY TO READ AN CONVIENT. "